Strikes a great balance between playability and control with rotaries, buttons and assignable pads galore. Masses of control options via rotaries, buttons and pads. Backlit drum pads can trigger notes or yet more MIDI control messages. Software Editor makes set-up straightforward. You may think that we could survive in our studios with little more than a computer, keyboard and mouse these days. However, plenty of us are now making music with technology onstage, whilst driving a DAW project from a mouse alone leaves a lot to be desired. Comprehensively spec'd USB keyboard controllers provide the perfect interface for note input and parameter tweaking, and Alesis' new VI controller keyboard series promises an extremely favourable feature-set and price point combination. The line-up is presented across three keyboard sizes, with 25 and 49 key versions below this 61 key model. The keyboard is semi-weighted, offering both velocity and aftertouch control and, whilst the playing surface doesn't provide the most sophisticated action, it's of perfectly reasonable quality for prolonged periods of note input. "By far and away the most eye-catching feature of the VI61 is the vast array of control options and pads"
In the top left-hand corner, you'll find pitch and modulation wheels, both of which are nicely resistant, reassuring you that they won't slip through your fingers. The rear panel offers a USB connector for MIDI interfacing (and for providing buss power), whilst traditional MIDI Out, Sustain and 9V power inlet ports complete the line-up. However, by far and away the most eye-catching feature of the VI61 is the vast array of control options and pads. The upper section of the keyboard provides 16 rotary dials, 48 buttons (arranged in three rows of 16) and a 4x4 matrix of pads. The latter can either be used for note input (making them perfect for drum programming), or for further control message triggering, and their backlights respond to velocity, providing you with visual feedback of how hard they've been hit. Furthermore, to the left of the rotaries, you'll find a row of transport buttons for DAW control, Octave Up/ Down buttons for extending the keyboard range, plus Tempo and Roll buttons, which can be used for drum roll triggering. A clearly cost-saving three-character LED display keeps you updated with parameter changes. Whilst this works perfectly well, compared to more fully-appointed screens, it does feel a little basic. However, all of this control comes within a compact and very portable frame. 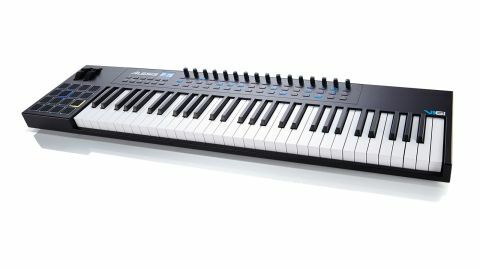 The front-to-back footprint of the keyboard is small and, whilst the keys are full-size and so determine the width of the keyboard, the VI weighs just 5.9kg, which should appeal to those intending to use it live. So, how on earth are all of those controllers organised? The answer lies in Alesis' dedicated editor which provides menus for each function - Knobs, Switches, Drum Pads etc - before then allowing you to configure MIDI Channel, MIDI Controller Number and Toggle On and Off values for each. So, if you're working with a soft synth which responds to MIDI controller data, assigning rotaries to your favourite 16 functions is easy, whilst there are 48 button-loads of support for parameters easily assigned to switches too. Once you've configured a particular controller collection, you can then send the whole lot over USB to act as a VI preset so, whilst you'll certainly spend some minutes configuring the set-ups of your choice over software, you can then dump them to hardware ready for access whenever they're needed. The rotaries all feature an inbuilt blue LED to show you their current position (which helps in low-light conditions), whilst the buttons also feature LED surrounds when activated. It's straightforward, flexible and really unfussy. Which rather neatly sums up this quietly impressive keyboard controller, which is immediately ready and waiting to respond to your playing and control needs. Very good.